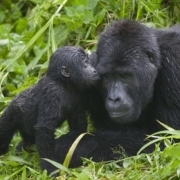 An excellent drama is presented within the BBC video production, “Mountain Gorilla, Kingdom in the Clouds” involving a three-year-old baby gorilla abandoned by her mother in the mountains of the African Congo. The baby was part of a Gorilla troop, but ignored and forgotten by the other members. This is a very dangerous situation for an infant gorilla who is normally well tended by her mother until the age of five or later. The other mothers took their babies into the tree tops to nest for the night, leaving this baby alone on the cold ground. The leader of the Gorilla family is a massive male Silverback a powerful and dangerous animal exercising total control of the troop. He’s too heavy for the slender tree tops, so sleeps on the ground. His huge muscular body generates plenty of heat so he stays warm all night. 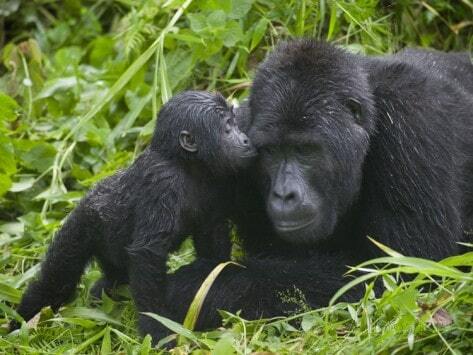 Silverbacks are known to kill infant gorillas they don’t recognize; the Silverback is not one to trifle with. With this scenario the men observing and filming this group leave for the evening, concerned for the baby. The observers are not allowed to stay the night for their own safety. The men return the next morning and find the baby missing. As they search around they discover the baby snuggled up in the arms of the sleeping giant, lazing about in the cool morning. The 400 pound Silverback permitted the baby to approach and even accepted and adopted her thereafter. It’s a small part of the entire story, but a part with a striking and heart-warming message. Sometimes trusting is the only option left to one in need. We all want to be independent, healthy and strong. But our situation and our fortune can change unexpectedly and often we’re not prepared for the change. The baby gorilla had to take a chance approaching the Silverback or perhaps die in the cold mountain night. Our circumstances may rarely be about life or death, but they could be. It is very common to face a puzzling array of confusing issues that may feel like a trap; there is just no apparent safe way to go. This is when we need to trust the help that is available. An empathetic, quarter-ton gorilla may not be the answer for us but like the wizened, experienced, powerful Silverback, a highly trained, experienced, empathetic person is often the dream come true for a person overwhelmed by circumstances. The therapists and counselors of Eastside Center for Families are able to shoulder the issues you might encounter that exceed your present limits. The professional skills and experience available to you to meet most any needs you may have recognize the trust you bring to the therapeutic session. Like the BBC video, our gorillas are strong, smart and deeply concerned with the care, protection and growth of those who come to us for help. How the heck do I find a “good” therapist? What is Somatic Experiencing?